View looking southwest from I-84. 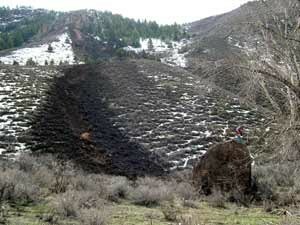 A rock fall (dark streak extending down the hillslope) developed as rocks rolled downslope, plowing up soil and vegetation. (Note person on rock for scale). 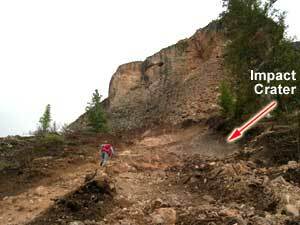 On the evening of March 22, 2004, a rock-fall event occurred in Morgan County, south of the Croydon exit along Interstate 84, about 8 miles east of the town of Morgan. The rock fall, which is easily visible from the road, released from the face of an 80-foot-high cliff and measured roughly 26x20x35 feet. What triggered the rock fall is not known; however, rock falls occur haphazardly and such events are not uncommon during seasonal snowmelt. Repeated freeze-thaw cycles can cause water trapped in fractures within the rock to freeze and expand. This process possibly led to the weakening of the rock mass, and triggered the fall. After dislodging, the large block slid down the cliff face, launched outward, then fell 25 feet before landing on the slope below. The size and velocity of the block was sufficient to form a large impact crater. Upon impact, the block broke apart sending several sizeable boulders downslope, some traveling nearly ½ mile, damaging large trees and vegetation along the way. 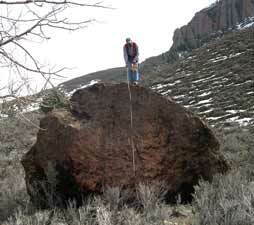 The largest of these boulders measures about 20x15x13 feet and weighs about 250 tons. 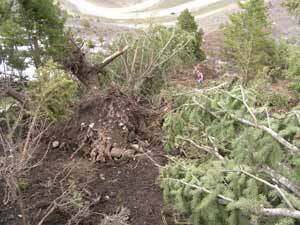 Fortunately, given the relative remoteness of the area, no property damage or injuries occurred.